Hi, I'd like to show you this page I found on Boulevard Home Furnishings's website. 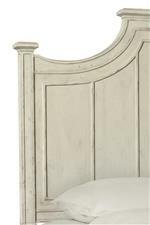 The Bella Cottage Nightstand with Weathered Finish by Bassett from Boulevard Home Furnishings. We proudly serve the St. George, Cedar City, Hurricane, Utah, Mesquite, Nevada area. Product availability may vary. Contact us for the most current availability on this product. Equipped to handle your modern lifestyle, this nightstand features an attached electrical outlet for safe and convenient device hook up. Charge your phone or tablet while you sleep, knowing your device is within reach for emergency calls, reading an e-book late into the night, or checking your email when you wake up in the morning. The outlet also works to reduce clutter, offering a simple connection for your bedside lamp or alarm clock that keeps your bedroom floor free of tangled and unsightly wiring. Finish & Paint Options Aged Whitestone finish. Select pieces are available with contrasting top. Calm and inviting, this collection brings a fresh take on a vintage antique inspired look. 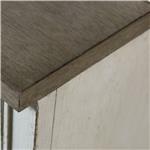 The cottage style emanates from the weathered finish and continues through the detailed moulding of each piece. With modern touches like soft self-closing drawers and USB ports, this collection achieves a vintage cottage aesthetic without sacrificing the appeal of modern practicality. The Bella collection is a great option if you are looking for Cottage furniture in the St. George, Cedar City, Hurricane, Utah, Mesquite, Nevada area.